WATER WILL BE TURNED INTO THE CANAL FOR 2019 ON APRIL 8, 2019. REMINDER: ASSESSMENT PAYMENTS DUE 12/20/18 ARE NOW PAST DUE, CALL FOR UPDATED BALANCE. SPRING PAYMENT WILL BE DUE 4/1/19 AND BECOME DELINQUENT ON JUNE 20, 2019. The New York Irrigation District is one of five irrigation districts of the Boise Project that operates the New York Canal. Our office hours are 8:00 am to 4:30 pm Monday thru Friday and we can be reached at (208) 378-1023. Closed for all legal holidays. If there is a water emergency or questions about water delivery you may contact the water master direct at (208) 342-5086. TO PAY WITH CREDIT CARD: CLICK YELLOW BUTTON BELOW, ENTER YOUR ACCOUNT NUMBER IN THE DESCRIPTION FIELD, AND THE AMOUNT YOU ARE PAYING. HIT CONTINUE AND SCROLL TO BOTTOM OF SCREEN; CLICK PAY WITH CREDIT OR DEBIT CARD. P4-100-2628 Tom Patton pauses beside the Settlers Canal. He has been a ditchrider for the Settlers Irrigation District since 1956. He was born in Idaho in 1895 and has spent most of his life in the Boise Valley. 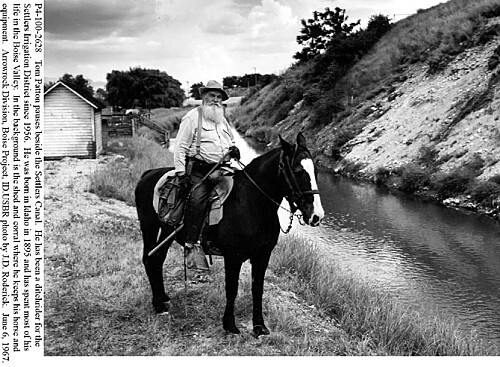 In the background is the shed and corral where he keeps his horse and equipment. Arrowrock Division, Boise Project, ID. USBR photo by J.D. Roderick. June 6, 1967. P4-100-2626 Reclamation Office Building for the Boise Project in Boise, Idaho. Clerical and engineering force in foreground. L-R: Herrick, Vernon, Ward, Sater, Cole, McBirney, Martin, Hogue, Tucker, Merrill, Evans, Hargraves, Tallman, Whittaker, Paul, Elford, Kubach, Evans, Price, Blomgren, Green, Young. Arrowrock Division, Boise Project, ID. USBR photo by Walt Lubken. Feb 1916. P4-100-2620 Revolving derrick for enlarging New York canal. Arrowrock Division, Boise Project, ID. USBR photo by F.C. Horn. Oct 3, 1906. P4-100-2532 View of Boise River Diversion Dam and headworks after construction. Arrowrock Division, Boise Project, ID. USBR photo by Walter Lubken. Nov 1908. 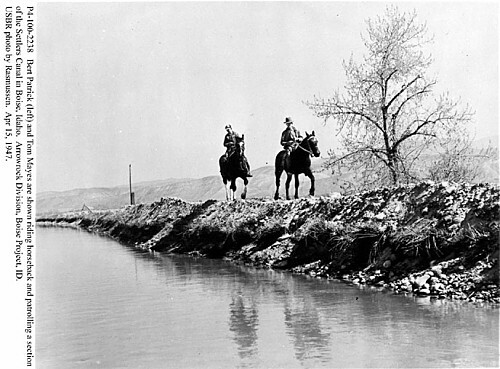 P4-100-2238 Bert Patrick (left) and Tom Mayes are shown riding horseback and patrolling a section of the Settlers Canal in Boise, Idaho. Arrowrock Division, Boise Project, ID. USBR photo by Rasmussen. Apr 15, 1947. 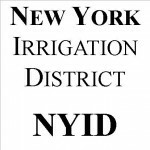 New York Irrigation District is a State of Idaho recognized Irrigation District operating in Ada and Canyon Counties. NYID has adjudicated water rights for 17,733.32 acres. The District currently has 17,040 water user accounts. The majority of these accounts are urban water users. The Board of Control of the Boise Project (of which NYID is a member), annually sets the water rates. For 2019 that rate is $68.00 an acre. NYID charges a $15.50 per account and $1.50 per acre -- Office Charge to cover the costs of administering all of the accounts and running the District Office. NYID earns a share of the revenue of the electrical production from Lucky Peak dam and returns this to the water users. For 2019, the Lucky Peak credit to water users is $22.00 an acre. 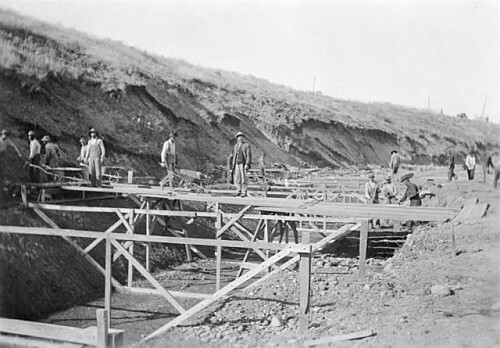 The first irrigated farming in the Boise Valley occurred in the 1840s at Fort Boise, a fur trading post of the Hudson's Bay Company at the confluence of the Boise and Snake Rivers. Major settlement in the Boise area did not begin, however, until the local discovery of gold in 1862. 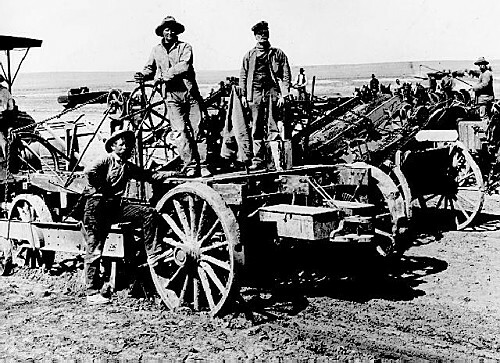 By the following year, the ensuing gold rush brought almost twenty thousand residents to the Boise Valley, most had to rely on supplies of food brought from outside the region. 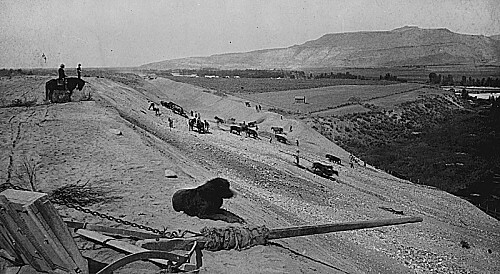 Farmers and ranchers quickly established local operations to feed the mining camps, and by the time the city of Boise was founded in 1864, fields were already being irrigated in the valley. Irrigation systems quickly grew from small canals dug by individuals to larger supply networks built and operated by private companies. 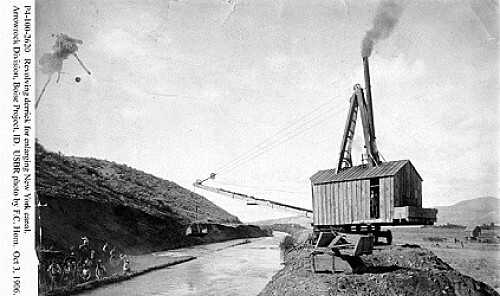 With further discoveries of gold in the area and the arrival of the railroad in the 1880s, irrigated agriculture continued to be profitable. This in turn attracted outside capital. 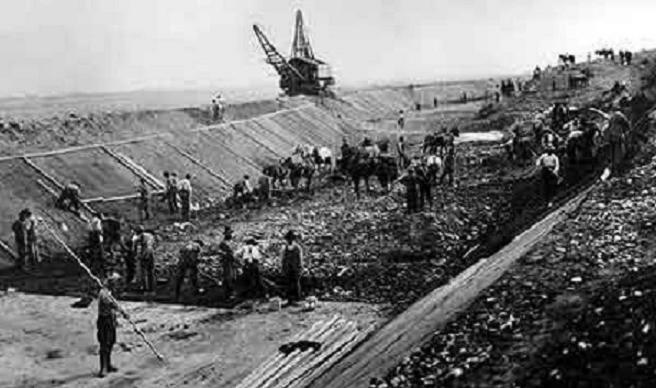 Larger companies developed larger canal systems, such as the New York Canal (which has since been modified by the Bureau), both for farming and to deliver water to placer gold mining operations. 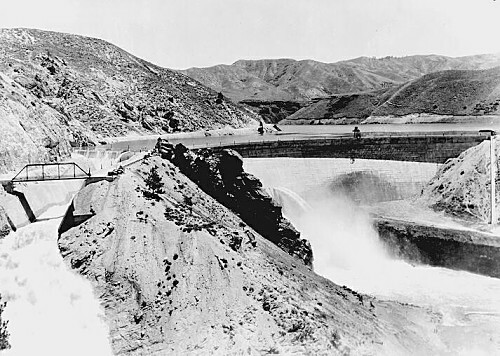 But by the end of the 19th century, about 148,000 acres were under irrigation, but irrigation in the Boise Valley faced several major problems, foremost among them a tangle of legal controversies over water rights and the need for upstream storage to provide reliable water supply late in the growing season. 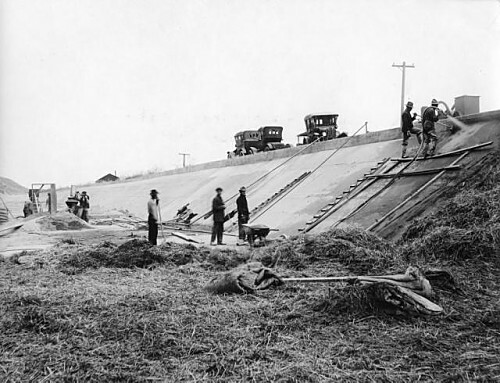 Passage of the Reclamation Act of 1902 offered a solution to the problems, because a comprehensive federal project could untangle the legal web and could afford the cost of storage facilities. 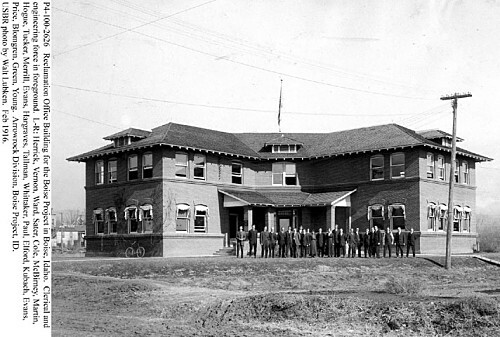 With the water rights cases about to be adjudicated, the Boise Project was authorized in 1905. It initially focused on irrigating lands along the Boise River. 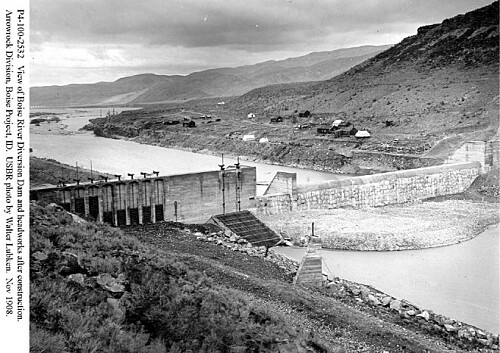 Major construction projects included the Boise River Diversion Dam, the Main Canal (now called the New York Canal because it follows the old New York Canal for much of its route), the Deer Flat Embankments which impounded a large off-stream reservoir known as Lake Lowell, and canals and laterals for the various irrigation districts served by the project, within 10 years, the Reclamation Service had built a hydroelectric generating plant at the Diversion Dam and another major storage facility, Arrowrock Dam at the juncture of the Boise River's main channel and south fork.